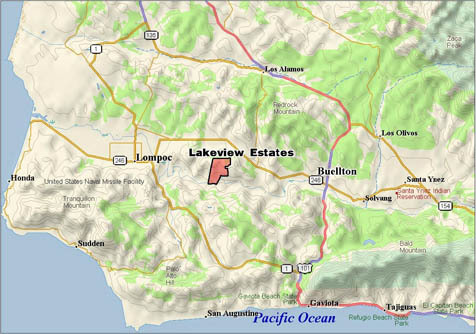 Owners of parcels in Lakeview Estates in the Santa Ynez Valley’s Santa Rita Hills plead their case before the Santa Barbarba Local Agency Formation Commission (LAFCO) yesterday, pushing for the creation of a community services district (CSD) for their subdivision. Landowners in the large lot agricultural area argued that the lack of services in their area has made it difficult to develop their parcels to their full extent. Because no specific development plans currently exist, the CSD proposal is not subject to review under the California Environmental Quality Act (CEQA), garnering the concern of community groups like the Citizens Planning Association, which stated that CEQA guidelines should be adhered to regardless of current development plans. Jose Baer, the manager of nearby Rancho de la Vina, dubbed the Lakeview Estates subdivision a “historical accident,” due to the development’s creation using a process which is no longer employed and the lack of the proposed lake. “If the map were approved today, conditions would be imposed to ensure adequate access, potable water to each lot and other standard requirements,” he wrote in a letter to LAFCO. However, the lots were found to be legal lots. Due to a lack of concrete development plans, LAFCO tabled the issue until their meeting in February. “LAFCO is hopeful that Cargasacchi and the Lakeview residents will be able to work something out before then. They don’t understand the bad blood that will clearly prevent any progress between now and then, and so LAFCO will still be faced with the same issue in February,” said Baer.